You are here: Home / Blogs / Training Wheels for Meditation? Have you heard of the Inner Balance App and Ear Sensor? It’s one of my favorite tools to help myself, and patients, practice the art of meditation because let’s face it, it’s not something most people can pick-up (and love) overnight. As a physician, I see a countless number of patients who struggle with daily anxiety, chronically high cortisol levels, chronic fatigue, persistent insomnia and a dozens of other complaints that could be managed with daily meditation. In fact, out of all of my years of practice, the most common complaints I hear involve the words “fatigue,” “stress,” and “anxiety.” What many patients don’t know is that there are some simple, yet truly beneficial practices they can add into their daily (or weekly) routines that can have an immediate impact on their symptoms. Meditation is one of those practices. What is the Inner Balance app? The Inner Balance™ Sensor for iOS is an innovative approach to improving wellness through training, education and self-monitoring. It helps you change your reaction to stress, gain insights in your shifting moods and create a more positive outlook on life, while tracking your progress, journaling your accomplishments and sharing it with others.With the Inner Balance app you enter how you are feeling in the moment and then run a session focusing on a positive moment. Research has shown that focusing on positive emotions like appreciation can greatly reduce the effects of stress and deliver you to a more calm peaceful state. 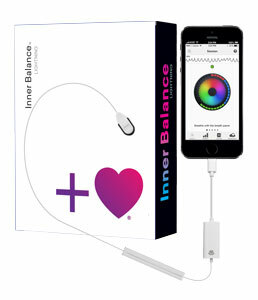 The Inner Balance App uses an ear sensor to capture your Heart Rate Variability (HRV) data. This data gives the most accurate, in-the-moment reading of your heart rhythm patterns. What should I feel? Or ‘what does coherence feel like’? Coherence is a state of internal synchronization between the heart, breath and the head. People exp erience coherence as a sense of inner calm and balance, an increased focus, while others experience coherence as a more relaxed state. While everyone is different and some people have more inner stress than others, most people experience some results within the first couple of weeks of regular practice. The effects of coherence will increase the more often you use your Inner Balance Trainer. When I use my Inner Balance app on a regular basis, I notice a dramatic improvement in my mood and energy. Whether you use this device or have another method of meditation, I encourage you to make it a daily habit. Your health is worth it! Get it here.